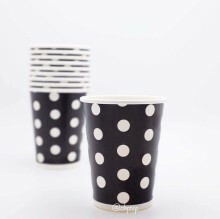 These paper cups will add a sweet touch to your party table. Match it with color coordinating paper plate, napkin and paper straw to create an atmospheric ambience. It can also be utilized as food container on your sweet corner. Fill it with candies, pop corn or even french fries!